social impact brands and businesses, creating viable shared ecosystems that are inclusive, equitable, sustainable and commercially successful. A pioneer in the ‘profit for purpose’ impact investment sector, REAL is an implementation partner that provides a bespoke brand and business approach. We incubate, accelerate and capacity-build social enterprises with a view to exit once the enterprise or project is sustainable. As experts in brand and business strategy, early stage development and leveraging Intellectual Property we have collaborated with Fortune 500 organisations across the globe with outstanding results. Our proprietary 360-degree process and minimum viable business (MVB®) model yields maximum results with reduced cost structures, designed to be scaled globally. REAL fills a gap in the market for early stage, for-profit social enterprises. Our approach is sensitive and human-focused, and our implementation model prioritises applied learning and mentoring programs. Our vision for global transformation through empowering and supporting the change-makers of the future is both inspiring and pragmatic in our ability to execute. HARNESSING CREATIVITY AS the catalyst for positive change. Our consulting approach is built on the principles of exchange, vision and transformation. We work together with our client partners to identify their strengths, goals and capacity; provide an unmatched field of vision for their unique brand DNA and the commercial and social landscape that will define their success in the marketplace; and harness human potential to build transformative global brands for the 21st century economy. REAL Impact is currently working with PNG artisans to take Papua New Guinea’s culture to the global US$38billion handicraft market. REAL Impact is creating an economic network that has scale while delivering real value to where it is most needed in rural PNG. REAL Impact’s work in PNG is supported by the Australian Government’s InnovationXchange and Pacific RISE. for purpose’ impact investment sector. REAL Impact delivers investor returns and measurable social impact by realising the potential of people, communities and brands –providing brand and business roadmaps, capital, business development and international networks to transform the global marketplace for good. REAL Impact utilises a holistic Minimum Viable Business (MVB) model, providing investment and management to artisans and SMEs that meet minimum business requirements to prepare them for early stage capital investment and assist the development of its informal economy. Operating through a social impact lens, REAL Impact facilitates sustainable connections between the extraordinary artisan skills of informal economies and the global creative industries of fashion and interior design. For us, the future economy is the REAL economy – an inclusive, equitable and sustainable global economy that deals in real value, financial returns and impact, for all. REAL is building high impact supply chains that provide access to global markets in a way that is educational, sustainable and considerate of producer skills, the world’s resources and consumers’ lifestyle demands. In the retail sector alone, if there was a commitment to buy as little as 1 per cent through high impact supply chains, this would generate more than US$200 billion in economic development for under-served, yet capable and incredibly talented communities worldwide. The time for untapped potential is over. There are real financial and social rewards at the ready for brands and businesses with a vision to the future economy. REAL specialises in creating considered supply chains. 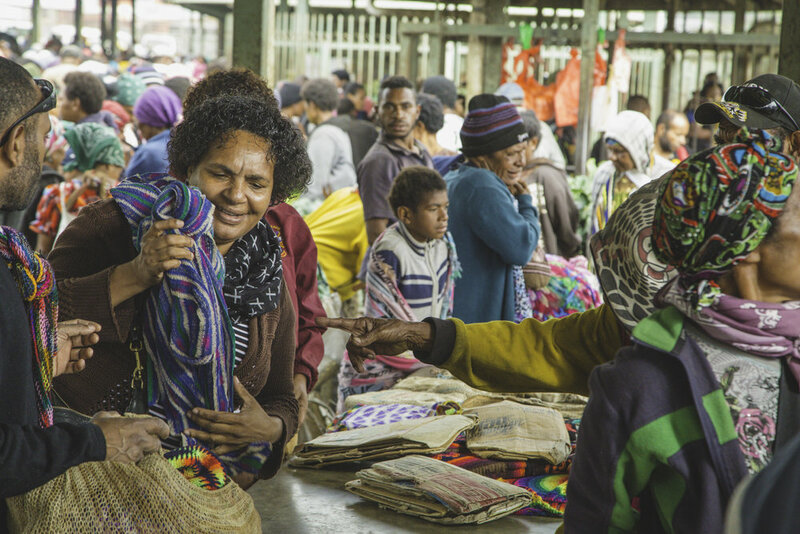 We are transforming global value chains currently in Pacific Islands to bring benefits across the total end-to-end value chain –from maker to consumer and our planet. Passion, purpose and motivation to succeed coupled with exceptional artisan skills, a globally experienced management team enabled by the digital economy, are key ingredients in our strategy for sustainability This will lead the transformation of the global marketplace and millions of lives worldwide. It’s possible, practical… and smart business. The REAL Foundation inspires and realises human potential, and activates the power of ideas to ignite social leadership and transformational change. We support emerging social leaders in their respective fields through mentoring and educational programs, critical community building and professional development, while providing pathways to social enterprise, investment and the realisation of their vision. The REAL Foundation serves as an advocacy platform for ideas that can spark change – building movements and communities of action around the world to ignite a new global reality informed by the UN Sustainable Development Goals and inspired by the REAL's social enterprise approach. Thomas Toyamina is from the remotely located Trobrian Islands, known for its signature carvings. He established his business, Pacific Primitive Arts in 2012 to bring Trobriand Island artifacts to the markets. His dream is to grow the capacity of his business to a level where it can reliably and consistently supply high quality handmade artifacts both internationally and domestically. Thomas is working with REAL Impact to generate a sustainable flow of business and economy back to the carvers on the Islands so that the heritage, skills and culture are sustained, valued and supported meaningfully. In partnership with REAL Impact, Australian designer Darcy Clarke and the designers from Gensler Sydney, Thomas has developed three bespoke carved wooden light designs, set to launch in 2018. "The future economy is the real economy – an inclusive, equitable and sustainable global economy that deals in real value, with real opportunity, and real impact, for all."